Laminate flooring offers a handsome style upgrade for any room of your house. The many advantages of modern laminate floors include their realistic appearance, ease of maintenance, and enduring beauty. Homeowners can choose from a wide variety of styles and colors, created to match any existing décor. Examples of this include laminate tile flooring and laminate wood flooring that looks just like the real thing. 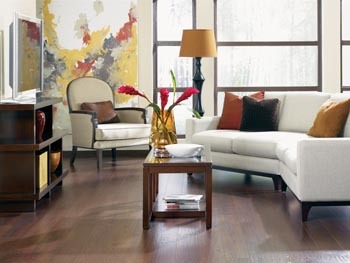 For the ultimate flexibility in style and durability, choose laminate floors for any room. At a reasonable price per square foot, printed laminate floors simulate almost any kind of natural and engineered flooring material in any pattern you need. Our 12 month finanacing is available for laminate flooring and installation to help you achieve the perfect look and feel in your home. Is It Ceramic or Is It Laminate Tile Flooring? One of the best sellers in our laminate selection is flooring that resembles ceramic tile. Our customers love the elegance of this type of flooring and appreciate the cost-effective price and low maintenance that is inherent in laminate. Discover the many options in laminate tile, such as a pleasing array of natural colors and visually appealing patterns. Laminate is manufactured with an image layer that mimics porcelain or ceramic tile, or even hardwood flooring. Our laminate flooring provides homeowners the unique opportunity to match your home’s reality to your imagination at a price-point that few other materials can beat. If you love the look of hardwood floors, but prefer a lower price and easier maintenance, the answer is laminate wood flooring. With an outer layer that mimics the wood variety of your preference, you can have it all. You can see the grain in many lustrous shades of wood that range from creamy pale to warm reds, soft grays, and earthy browns. Busy households do exceptionally well with laminate flooring. Regular mopping and sweeping will keep these floors looking like new for years, even in high-traffic areas. Laminate is created with a durable seal to resist water damage, making this flooring ideal for kitchens and bathrooms. Homeowners also use laminate flooring for areas that pose a challenge, such as hallways, as well as in adjacent rooms to provide a smooth, continuous expanse of beautiful flooring. Mannington™ – Known for gorgeous hardwood floors, this manufacturer has turned its expertise to laminate. Along with hardwood, Mannington offers laminate in the styles and colors of hardwood that are most appealing. FloorCraft™ – This well-known manufacturer produces naturally appearing laminate with all the glory of hardwood. The secret is the image layer, which contains the whirls, grain, and patterns of real wood, along with a rich range of lustrous colors. Mohawk™ – Nature serves as the inspiration for Mohawk’s luxurious line of laminate flooring. Delight in laminate that replicates oak, hickory, maple, cherry, teak, pine, rosewood, and walnut. No one will know that your flooring is not real wood. Shaw™ – Innovation is what makes Shaw a leader in laminate and other types of flooring. With advances in manufacturing, flooring made by Shaw looks just like real wood or ceramic tile. You have your choice of shades, finishes, and patterns. You love the laminate flooring you have chosen and want it to last forever. It will last many years with professional laminate flooring installation. On our staff, we have certified technicians who know the proper procedures for installing your new flooring. It is essential to follow the manufacturer’s recommendations and our professionals know exactly what is required of the different brands of laminate we carry. Let us tear out your old floors and dispose of them, clean the subflooring, and carefully install the new laminate piece by piece. We make sure that your flooring lies flat with no edges sticking up that would make it vulnerable to damage. Our technicians also ensure that your laminate adheres securely to the subfloor so it does not move under stress or pressure. When laminate is installed correctly, the full beauty of this flooring option is readily evident to anyone who enters your house. All of our laminate floors come with our Lifetime Installation Guarantee. If you have any problems with your laminate, let us know and we will fix the problem at no cost to you. Come into our showroom today and let our flooring experts help you find the perfect laminate floor for your home. When you want striking, low-maintenance flooring, choose lovely, long-lasting laminate flooring. Call now or come in today to talk to a flooring expert about laminate flooring, or our 12 month financing program. We proudly serve the communities of Painesville, Lake County, Mentor, Concord, and Willoughby, OH, plus all of the surrounding ares.